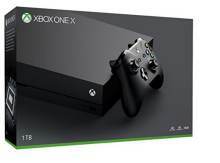 Sunday 21 Apr - Latest - Released on the November 7th, the Xbox One X Console is the latest and fastest console yet from Microsoft. A number of retailers have started taking preorders with stock shortages likely in the run up to Christmas. We constantly track for stock which ensures you will be the first to know when availability is found. Recommended retail price $499.99. We constantly check for XBox One X Console stock, so you don't have to. Receive email alerts when XBox One X Console online stock is found.